DENVER (CBS4) – Some Denver residents are questioning an expensive plan to prevent flood damage. The $300 million project would turn part of the City Park Golf Course into a lake. The city says it has to be done, but some neighbors argue the plan just doesn’t make sense. 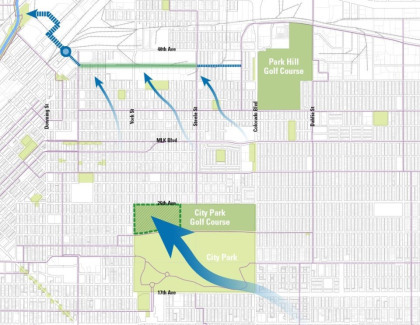 The Platte to Park Hill Project consists of four smaller projects and promises to stop flooding like one that occurred in the Cole neighborhood. But the part drawing the most ire is the plan to turn the City Park Golf Course Into a retention pond. “You’ve seen more and more attention being paid to this. There’s a $300 million cost for this whole project which is a ton of money and we think it can be used better,” attorney Aaron Goldhamer said. Opposition is growing. Last week the Denver Democrat executive committee passed a resolution opposing the project. On Monday a legal fund reached its first goal through online fundraising. Goldhamer is preparing for an August trial against the city to stop the project. The city deadline for bids on the project is just a few weeks away. Denver Public Works has a detailed plan of the stormwater detention area.